Several mornings we had breakfast from the Beach Blanket Buffet, although mostly it was Mom bringing food back to the room from it. Mik really enjoyed the doughnuts. He liked the ones with cream filling the best, although they didn't always have them. 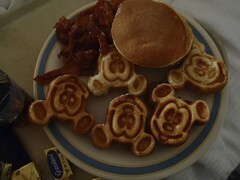 The Mickey waffles were also awesome, although they are quite doughy as are the pancakes. Like with the doughnuts, the Mickey waffles were not always there.